Yesterday, the House Oversight and Government Reform Committee held a hearing on “Preventing Violations of Federal Transparency Laws.” This is a huge problem. 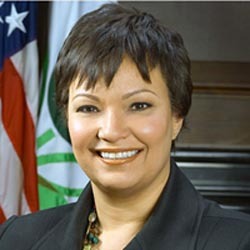 When agencies flout transparency laws — as for example the White House, the EPA, and the National Highway Traffic Safety Administration (NHTSA) did when negotiating motor vehicle fuel economy and greenhouse gas emission standards under a “put nothing in writing, ever” vow of silence — they obstruct congressional oversight, facilitate corruption, and undermine the government’s accountability to the public. At the hearing, Jackson argued there was no impropriety in instructing Taylor to email her at home, because she and Taylor are friends, and she was trying to move a private conservation to her private account. 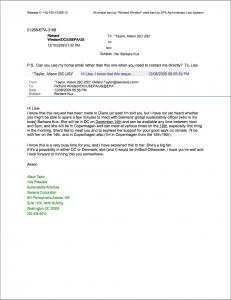 The text of the email (see bottom of post) contains no hint or suggestion that Taylor emailed Jackson to discuss a personal matter, and none that Jackson was trying to clarify the need to keep discussions of personal matters out of government email. Rather, thanks to Gowdy’s persistent questioning, it’s obvious that Jackson was inviting Taylor to use Jackson’s home email to discuss official EPA business. As Chairman Darrell Issa (R.-Calif.) pointed out, conducting official business via personal email defeats the intent of transparency laws like the Federal Records Act. The FRA requires agency heads to “make and preserve records containing adequate and proper documentation of the organization, functions, policies, decisions, procedures, and essential transactions of the agency.” Communications conducted via government email accounts are automatically captured for record-keeping purposes. In contrast, conducting official business via personal email empowers agency officials to hide or delete conversations with lobbyists and other interested parties rather than preserve those communications for the record. In the video of the hearing, Gowdy’s examination of Jackson, with Issa’s follow-up, runs roughly from 113:50 to 120:15. My unofficial transcript of the segment follows. Gowdy: Ms. Jackson, “Can you use my home email rather than this one when you need to contact me directly.” Why did you say that? Jackson: Because Alison Taylor, the author in the email chain, was a friend, and I believe a personal friend should use personal email. Gowdy: Is there an exception for personal friends in the Federal Records Act? Jackson: Sir, as I have already stated, my intention was to comply with the Federal Records Act. Gowdy: That wasn’t my question, actually. Is there an exemption or an exception that you’re aware of for personal friends? It’s a simple – it’s not a complicated question. Are you aware of an exception to the Federal Records Act for personal friends? Yes or no? Jackson: The Federal Records Act is . . . the intent is to make sure that official government business is captured in official government accounts. Gowdy: Well, what she was emailing you – would you consider that to have been official government business? Jackson: As I said earlier, Sir, she had requested through official channels a meeting for her super… her employer. Gowdy: Do you think that was a personal meeting or a meeting in your professional capacity as the administrator? Jackson: The meeting would be handled through professional channels. Gowdy: Alright so it was a professional email that she sent to you and your response was contact me on my personal email. Jackson: No. The response included saying that we would work to set up the meeting, and what I say is that if you need to contact me directly – this is a friend talking to another friend . . .
Gowdy: Is it possible that a friend could contact you about a matter of professional business? Is that possible? Gowdy: It clearly has to be possible because that’s what’s happened here. Jackson: Well, I’m happy to answer the question, Sir. I would say yes. Gowdy: Okay, so why would there be an exception for friends to use your personal email even if it might be official government work? Jackson: Sir, because friends use personal email. If there’s official government work involved then under EPA policy I would then have to forward it in to an official account so that it could be captured for record-keeping and archiving purposes. Gowdy: Well, Ms. Jackson, I’m sure you could see how a skeptical reader of that email might reach another conclusion, wouldn’t you? Jackson: I think that if someone has the intent to see something more there, that’s fine. But the email talks about a meeting being scheduled through official channels. Gowdy: Right, and she used the Richard Windsor email and she didn’t have any trouble getting to you through that email. And your response was can you use my home email rather than this one when you need to contact me directly. Jackson: Again, if you look at the entirety of the email chain . . .
Gowdy: I don’t have the entirety of it. I’d be happy to look at it. Jackson: It’s on the EPA Web site, it’s been released under FOIA. I also gave it for the record. Issa: Will the gentleman yield for a second. Issa: I just want to make sure the record’s clear. 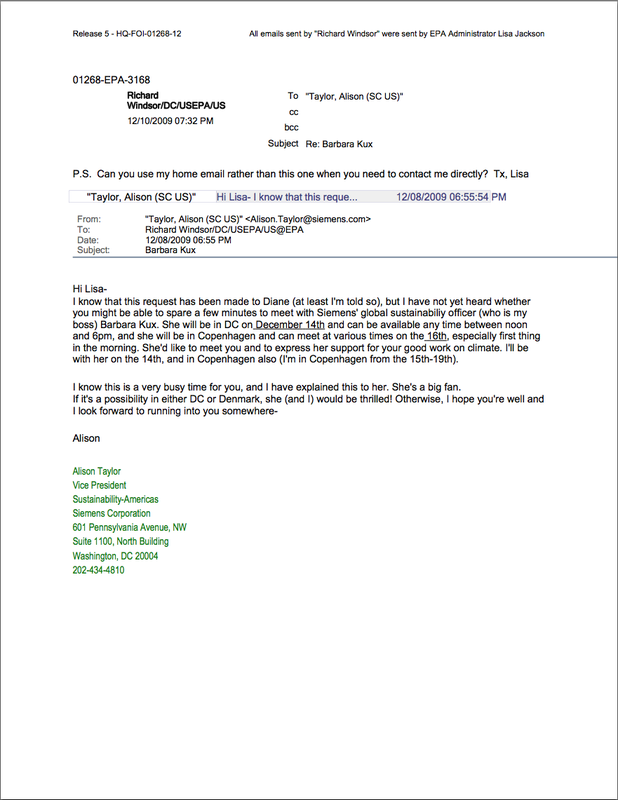 For Alison Taylor to contact you at your Windsor account you had to give her your Windsor account; it wasn’t public. Jackson: I actually do not know how she got the account address. I do not know. I don’t have those records, I don’t have the Windsor email accounts available. Issa: And I think Mr. Gowdy hit everything except one sub-question. You said in your testimony that you would determine when something would be forwarded. Isn’t it true under the Federal Records Act you don’t get to decide what’s relevant? It is . . . your entire database is often looked at for discovery. So in the case of your private email, you’re deciding what you think, and Mr. Silver and Mr. Gensler are deciding what’s relevant, rather than a neutral third party deciding whether something should be discoverable. And I think that may be part of what Mr. Gowdy was alluding to. That by a lobbyist contacting you outside of government chains it becomes, well, ‘I’ll turn over what I think is relevant and delete the rest.’ With that, we go to Mr. Davis. Jackson: May I respond to that? Issa: There wasn’t a question there. There was an observation that someone had your personal [non-public] government account, that you gave a lobbyist your personal [home] account and that person was asking for an official meeting in that train. You keep saying go to your Web site. Your Web site shows you had a lobbyist trying to do official business with EPA, you had someone who was in the process of trying to work with your agency, and you’re giving them a private email and not telling them, ‘You know private email, if you want to talk to me about the dinner dance, go to my personal email, no you were telling them use my personal email and use it.’ You were not in that train so specific on how to divide your personal life with this friend – who you don’t even know how she got your non-public government account. You may answer. Jackson: Thank you, Mr. Chairman. Respectfully, the email chain, if you look at the entirety, includes a request for a meeting that’s gone through official channels. It’s addressed to me as “Lisa.” I address her as “Alison.” She says, ‘there’s no business to be done, we think you’re a rock star,’ it’s conversational in nature. So my only intent was to simply say, ‘Hey, friend, if you want to contact me directly, use my personal email account. The business that was done was handled through official channels, Sir. Issa: Ms. Jackson, I appreciate all that. But let’s understand that the IG of your former agency has made it clear that we have lost forever and will not have your entire train of official activities. They have discovered that much of what we’re asking for simply no longer exists. And that’s been told to this Committee. So in the case of your activities using personal accounts, we will not get full discovery, the public will not get it. The fact is EPA has not met its responsibility for transparency. And quite frankly, Mam, that means you’ve put us at risk of lawsuits for decisions made in which people suspect that emails that have been lost would help their case rather than yours. That’s a real problem and that’s the result of when people don’t do their job right. And clearly you didn’t do your job right when it came to making those available. And that’s also in the record and people may look at it. Previous post: America’s Energy Advantage Calls for Nat Gas Export Restrictions – Again. Why Now?